Here they're worn over turquoise and lavender striped short socks. Very nice colour. Oh, I love those sandals too. Thanks. I have a pair, several years old now, of gray sandals that are very similar, but the moment I saw the red ones it was...MINE PLEASE LET THEM HAVE MY SIZE. Which they did. The grays are showing a lot of wear, and will still be my backup pair. Who makes the sandals please? They are exactly what I have been looking for. The royal blue is a lovely strong colour. Though it does make me think of my school uniform swim suit, for some reason we had to have that in royal blue (with our initials embroidered on to it) even though the rest of our uniform was navy blue. Funny wwhat brings memories back. I get them at R.E.I. in Austin. The website gives you styles and colors that may not all be available any one place. Not cheap, but sturdy, comfortable, and stand up to wear (I wear my gray ones on the bike, and they've handled some emergency stops well. 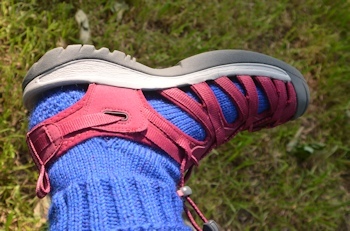 I like the toe protection, while still having airflow on my feet. You need to find a place to try them on; sizing is not perfectly consistent style to style. They've had their 24 hours of wear (actually a bit more) and a washing and it was warm and bright enough to get them mostly dry on the line today. 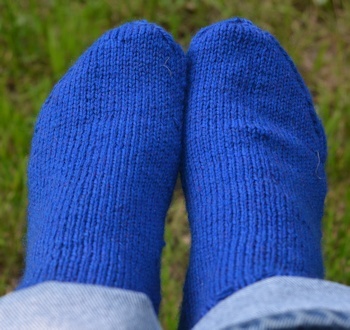 Generally comfortable, hard to estimate if they were warmer (because denser, made with smaller stitches) because I have been sick, off and on feverish. They are now finishing their fourth wearing. 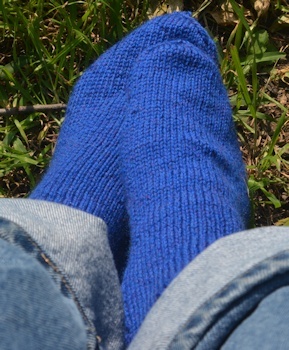 The tighter texture on the foot is offset by the this particular yarn being somewhat softer and fluffier. 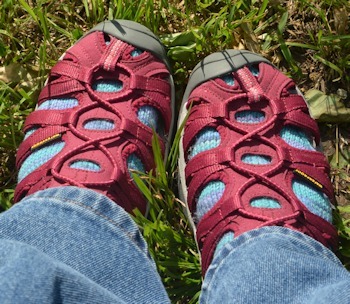 They do feel very slightly warmer on the foot, but the temperature's been zig-zagging from upper 80s/low90s by day to 40s and 50s at night, which makes comparison day to day difficult. I wore them today riding my bike for a mile, so they're fine for that.